crosses above the MA 21 to go short when the MA 9 crosses below the MA 21. 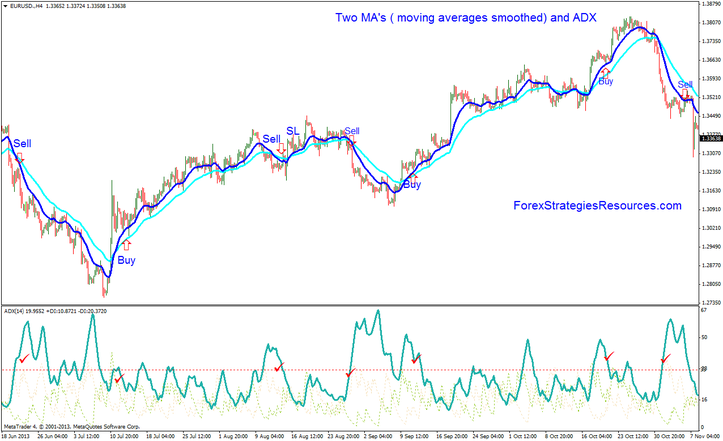 1. moving average (MA smoothed) with period 9 (MA 9). 2. MA with period 21 (MA smoothed 21). 3. Average Directional Movement Index default setting (ADX 14). A level of 33 is added. 1. Wait for the MA 9 to cross above the MA 21 and the ADX is> 33 level. 2. Take an entry when the price comes back down to touch the MA 9. 4. Profit target with ratio 1:2 stop loss or exit position when MA cross in opposite direction. 1. Wait for the MA 9 to cross below the MA 21 and the ADX is>33level. 3. Set the initial stop loss 15 pips above the MA 21 and after 30 pips in gain move stop loss at the entry price(Time frame 60 min- for time frame240 move initial stop loss after 45 pips in gain). 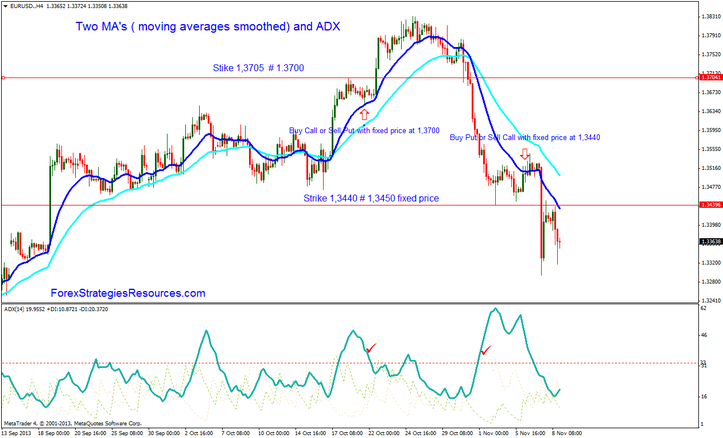 This trading system is also good for trading with Options and Binary Options. Wait MA 9 cross above 21 MA and the ADX is > of 33 level. This event is an alert for Buy Call or Sell Put. Draw on the chart an line at the level of the previous High swing, This level is the strike or the fixed price. When the price comes back down to touch the MA 9 Buy Call or Sell Put with the stike at the level of the previous high swing ( In the example buy call or sell put with the strike 1,3700, the fixed price). Wait MA 9 cross below 21 MA and the ADX is > of 33 level. This event is an alert for Buy Put or Sell Call. Draw on the chart an line at the level of the previous Low swing, This level is the strike or the fixed price. When the price comes back down to touch the MA 9 Buy Put or Sell Call with the stike (fixed price) at the level of the previous low swing ( In the example Sell call or Buy put with the strike 1,3700, the fixed price). The expiration time of the option is relative to the risk that a trader wants to hire.